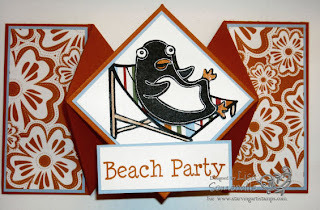 Here's a few more samples using Starving Artistamps DoodleFactory Tropics Set and Sentiments. 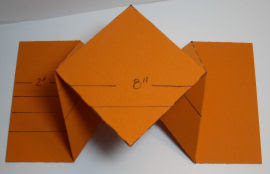 The fold on the Beach Party card is similar to the Spring Card shown here. My friend Laura gave me the dimensions she received from a friend who found them on You Tube. Card Stock: 4" x 12"
With your card stock horizontal, score from top to bottom at 2", 4", 8" and 10"
Make a small pencil mark at 6"
Your card stock now looks like two "x's" with a vertical line through each and a vertical line at the end of each "x"
Valley fold your straight score lines at 2", 4", 8" and 10"
Be sure to stop by the Starving Artistamps Blog and check out this sample using the DoodleFactory Tropics plate. 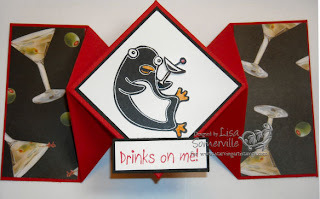 Use code Lisadis to save 10% at Starving Artistamps.